– What do you like about the game? – What do you dislike about the game? – What could be improved about the game? I hope those questions inspire some interesting feedback. At this point, I’m kind of in grind mode. I churned through a bunch of bugs in the past 48 hours. 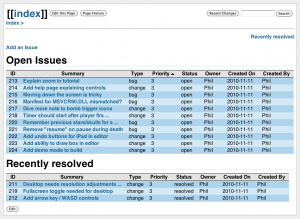 And did a bunch of user-interface changes. The game is getting more perfect. Here’s a shot of the bugs and changes I’ve made. I’m getting pretty happy with how things are feeling. I’ll thank the beta testers for all their feedback once again, and Tim (my brother-in-law, who does most of my music) for providing a number of pieces of UI feedback which really helped. The most visually interesting change is that now I tally up scores in sort of a jackpot style, like in most games. The shot doesn’t do the effect justice, but when the “Win” screen appears, each of the numbers is reduced to 0 while the score increases to the total score for that level. It’s pretty cool. This was Nan’s suggestion, and it seemed to be a pretty fun one! Makes beating a level feel that much more rewarding. 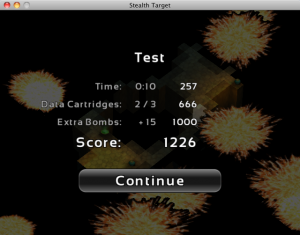 So, Nan did a test run of the iPad version of Stealth Target today. There’s always a handful of platform issues to deal with in porting! Like, on the iPad I don’t need a Quit button! 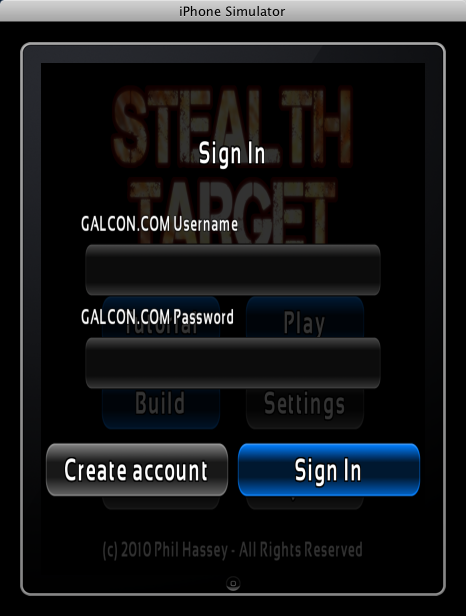 As always, I need to modify the interface a bit more for touch. The mouse and touch interfaces are really quite different, so I always want to make the experience work “the best” given the interface being used. A new challenge for me is adding pinch to grow/zoom support to the game. 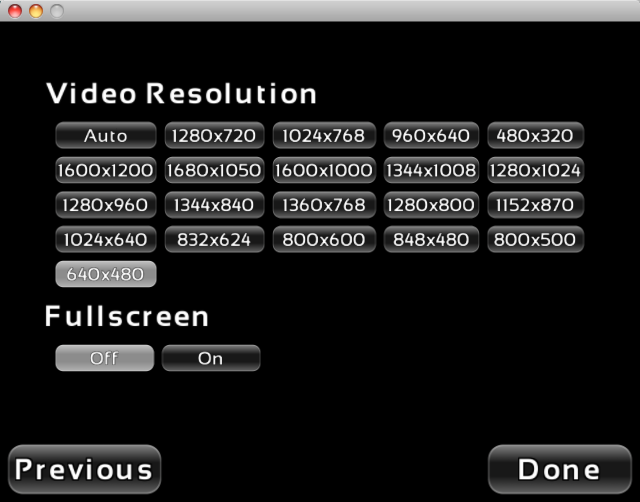 In the desktop version the mouse-wheel controls this. To implement this for a touch interface, I need to track where the center of all touch events is, so when a motion happens I can see if that motion is going towards or away from the center. This is a bit tricky, since finding where the center of a multi-touch event keeps changing as motion keeps happening. I found that technique didn’t work. What did work was passing along with the event a distance value between that touch and each other touch. This way, no matter how many touches are down, a reasonable zoom value will be passed. Many people were confused by my announcement 10 days ago. So I’m going to try and explain it a bit better! Stealth Target is not a finished game. If you look at the screenshots and video I’ve posted, almost none of the graphics you see are final, they are all free graphics or stuff I hobbled together quickly so as to get the game basically working. What you’re looking at is not what I will be selling to the general public when the game is finished. 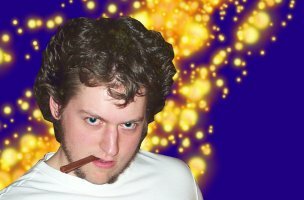 I am a solo indie game developer. That means there’s just me doing the bulk of this project. My wife Nan helps with the testing and some of the ideas. And I contract out the art and music since I’m only so-so at those things myself. I don’t have a team of 50 Q&A guys in my basement who test my game for me non-stop. That’s what the beta is for, it’s a way for me to get feedback from the users who are interested in helping me out! Anyway, I want to give a huge thanks to the people who have played the game already and given me feedback. I’ve just posted a new build of the game with a bunch of new features and fixes based on their feedback. You can check my blog to see what all changes I’ve made and how the development has proceeded. 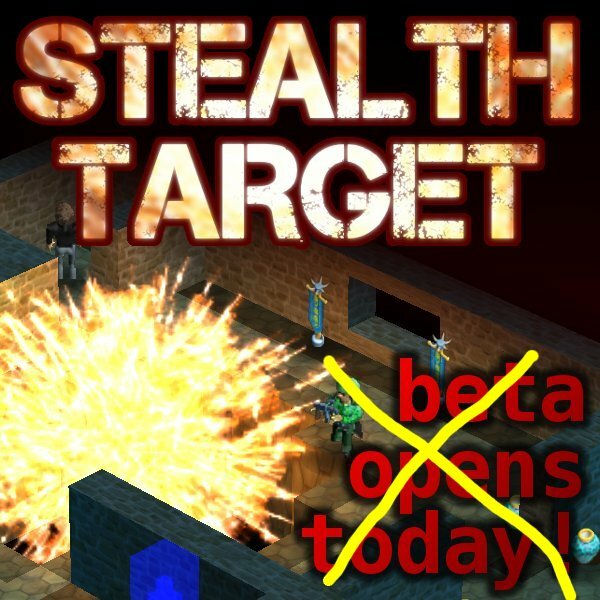 So, all that said, if you’re feeling brave, go ahead and pre-order Stealth Target for 50% off the full-price, today! For the less brave, feel free to wait it out until I have a demo ready. 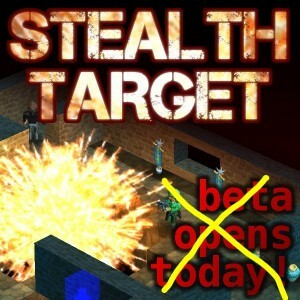 Stealth Target: Day 34 – More bugs resolved! I’m quite happy with all the feedback I got from the beta-users. Tomorrow I hope to post a build. Update: as an added note – the primary features added are keyboard controls, full screen / resolution options, and better mouse controls. I’ve got 10 other items in my tracker, and I’ll see how many I can get through. I’m hoping to post a new build on Saturday and send out another mailing. So .. I spent today making the game feel good on the iPad. The key items I had to get working work some “smart navigation” so that mis-touches would send the player towards an open spot and not just onto a wall. This makes navigating much easier as most locations you would want to walk to are along walls anyways. This also improves the desktop interface with the same features. I also added the ability to pan around the level by using two fingers like in many other apps. This works well. 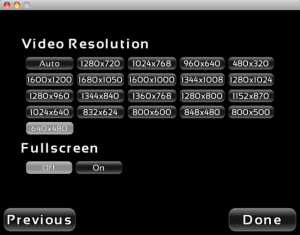 I haven’t decided if / how I will support zoom in and zoom out. I’ve gotten a ton of emails from artists and musicians, but it’s all pretty hard to sort through! I haven’t done much contracting out, so it takes me a while to figure out what I’m doing. Hopefully it’ll all start to make sense soon. The response from the beta sale has been excellent. I’ve gotten a number of people giving me great feedback. 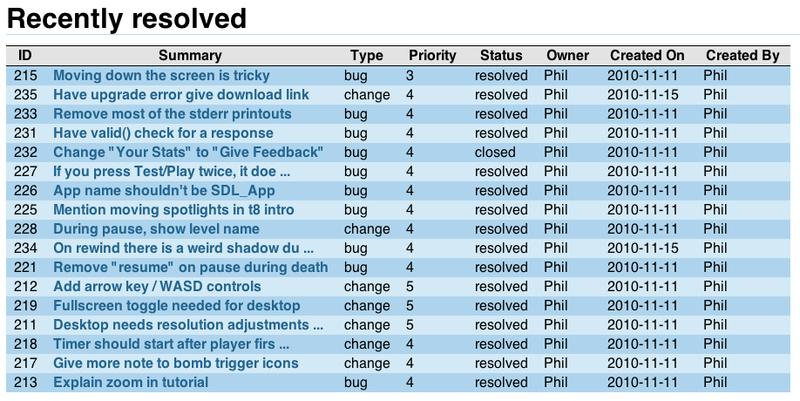 Over the next few days I’m going to use all that feedback to update a build for this weekend. I may also try and get it working as a demo version so that I can expand the beta to more people. And getting all those systems to work nicely together when say, the devices is reoriented, or the keyboard pops up is a bit of tricky business! It took a bit of messing with provisioning profiles, but I got it to deploy to the iPad, eventually. I also add to add setup for the depth buffer into ES1Renderer.mm .. This is not included for whatever reason. Then I got to do some iPad specific tweaks – since the game was first for the desktop, some of the code is specific to the mouse interface. I’ve wrapped some #ifdefs around those things to check for BUILD_DESKTOP or BUILD_TOUCH so I can have some code that checks for certain mouse buttons and some code that doesn’t. 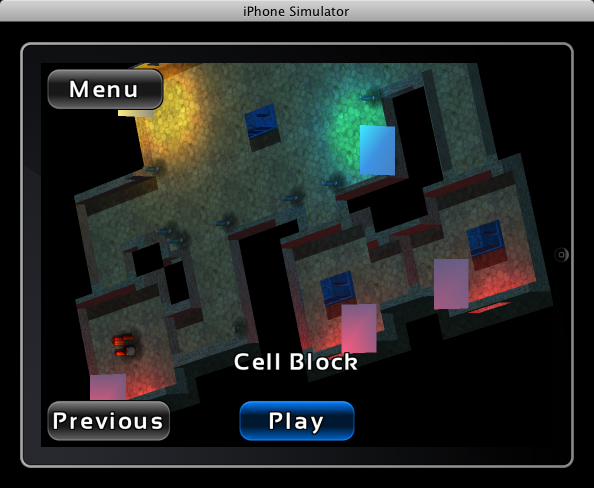 – Get the mini-level preview screens working better. So by changing my rendering to use GL_ONE (additive) blending, I can easily see where I have overdraw happening in my scene. That shot has GL based backface culling enabled, but I’m going to disable it so I can do my culling on the software size so I don’t use so much memory in my buffers. Not sure if that will give me a performance gain or not, but it’s something to try out. That seemed to produce an .aac file. 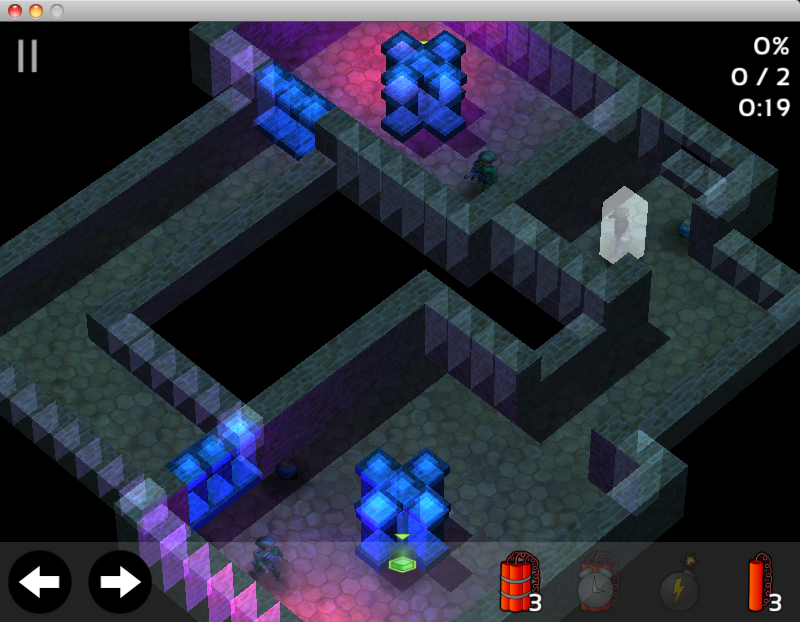 From investigating speed issues on the rendering, it seems my use of GL_LIGHTs is slowing down things considerably. If I disable all my lights it renders much faster. I may have to investigate some other options here. Anyway, it’s nice getting this game started on the iPad. 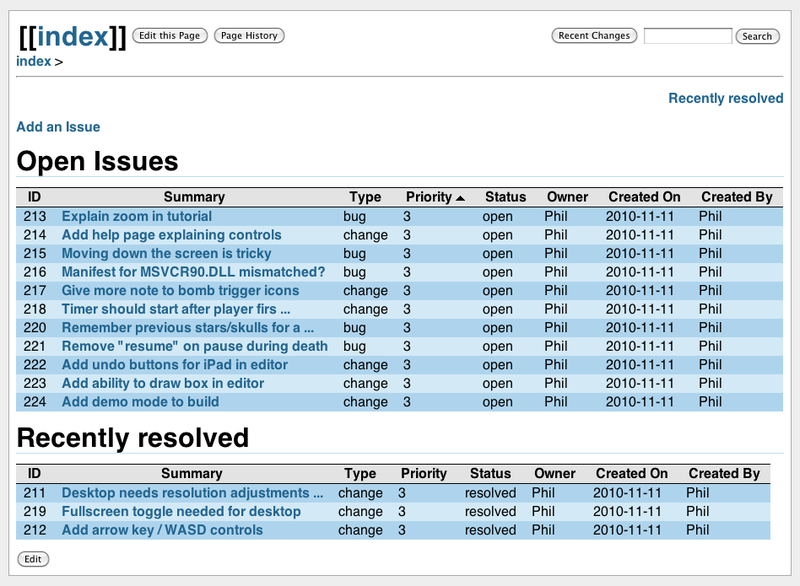 I think it’ll come together pretty quickly with another day of tweaks. I’m going to try and get this game “running” on the iPad. At least, compiling. I’ve got only a couple hours, so we’ll see what we can do. – Created iPad project. Moved in all files and game assets and gave it a build just to see a big number. 755 errors! Swell! – I set up my standard -D defines. Error count down to 348. – Added in proper loading of the iOS OpenGLES headers. Down to 78. – Fixed use of SDL_ defines in my code to use my generic defines for various keys. Down to 42. 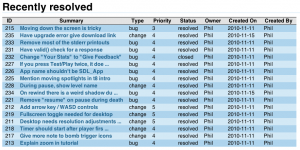 – #ifdef’d out all SDL stuff based on my USING_SDL define. Down to 19. – Created a few iOS / ObjC specific functions in a .mm file. Down to 17. – Changed all GLdouble to GLfloat. Down to 5. – Included “glues” a GLU for ES implementation. Down to 0!! Now onto the linker errors. I’m starting with 6. The are all the missing audio functions. I’ll have to get my iOS audio code copied over from Galcon Fusion for this. Got rid of those, but now I’ve got 18 other linker errors. Trying to work out what Frameworks I need, I guess. Just needed “CoreGraphics” it appears. And I’ve got a build! It’s a dummy build, in that it just shows the default bouncing box that the project includes. I’ve got to connect the iPad app to the actual game now – but having it compile without errors is always a good first step! … and … I’ve got a visual! It’s oriented wrong, and I don’t have it handling events yet, but hey – it worked! Wow! Anyway, I guess that leaves me something to do tomorrow!